From Pedicures to Puddles: "Hide your wound, Not your style!" As a boy mom, I am definitely familiar with the bandage aisle at the store. The poor buddy has had several ouchies recently! My options are usually tan or characters...boring! Not anymore! I came across the Ouchies bandage online and like what they have created! It is a parent team that saw a nitch in the market for cool bandages for all ages. 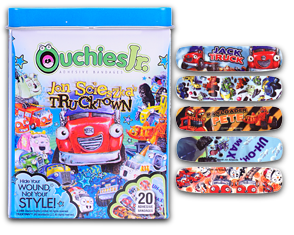 My personal favorites are the Make Ur Own bandages, and the Trucktown bandages from Ouchies Jr. 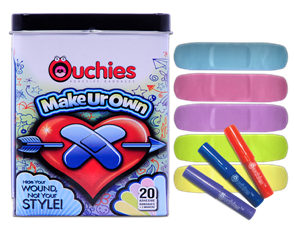 The Tin comes with 20 bandages in 5 different colors: blue, pink, purple, green and yellow and 3 markers: red, blue and purple. Something for everyone in the family!